Cranmore is crazy for Kids- Cranapalooza! Kids driving you crazy yet? It’s usually mid-winter when the house starts to feel real small and the kids are climbing the walls. You want to get them outside, but ski trips and tickets are pricey. Cranmore may have the cure, if you can head north to North Conway. Cranapalooza is the name if you’ve got game. On Saturday, Cranmore sells an all inclusive ski ticket for the whole mountain for the afternoon and evening with snow tubing, mountain coaster and giant swing rides plus access to the Indoor Adventure Center, plus skiing and riding till 6pm and fireworks at 6:30pm. Cranmore‘s lift ticket alone is good value but the bonus of a bonfire, fireworks, face painting, music and magicians and activities going on at the base makes it very festive and fun for families. Mind you, I am a first tracks, first chair kind of skier. I am often clocking out by noon with over a dozen magnificent morning runs. But now that I have teenagers, I can relate to the benefit of skiing later. The kids can sleep in, the drive to the slopes is far less frantic and furious with a leisurely “pack and go” pace to arrive early afternoon. 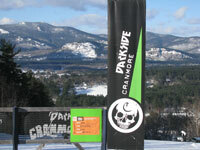 The Cranapalooza ticket accesses skiing and riding from Cranmore’s summit on 12 lit trails (unlike many ski areas where night skiing is limited to the lower mountain). The high speed SkiMobile Quad is a swift lift to the top, so the kids can make plenty of 1,200’ vertical laps under the lights. If you have terrain park fans in your family, they can have at two parks. Serious free skiers and riders will love Cranmore’s rails, jumps, picnic tables, even stairs (crazy contraption). The big park is located on the lower part of the mountain, so Mom can always watch (in horror) from the lodge as the kids get their hits. Little kids will be excited when C-More the Penguin comes out and flaps around for family photos. Magicians, puppets and face painting are part of the carnival atmosphere of Cranapalooza. Bigger kids will enjoy the tubing, Giant Swing, Mountain Coaster and Indoor Adventure Center until 9pm. Fireworks fill the sky at around 6:30pm many Saturday nights as part of the party, and Cranapalooza also occurs on Wednesday during school vacation week. As parents, you can ski too, sit by the outdoor fire pit, or enjoy an après ski beverage and entertainment at Zip’s Pub. 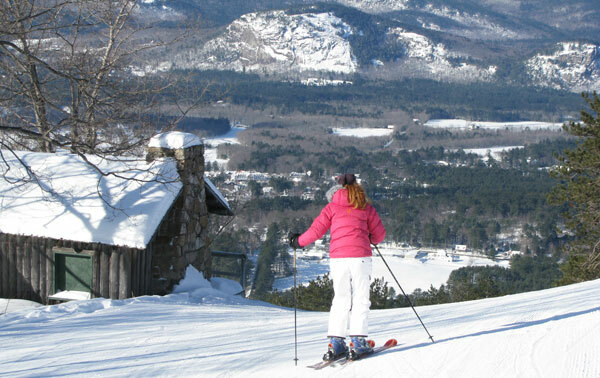 I suppose if your kids are old enough to ski on their own, you could slip into town for real romantic dinner at one of North Conway’s best restaurants.